From the Route 115 and Route 2 intersection follow route 2 north for .4 miles. Directly opposite Six Gun City turn right on Ingerson Road. At 1.0 miles bear left at the intersection with Pond of Safety Rd continuing another 1.3 miles to the unmarked Priscilla Brook Trailhead on your right just before the single lane bridge crossing of Priscilla Brook. There is a small pull off capable of squeezing 2 cars and roadside parking is available. I planned on hiking a different mountain today however my late start, last nights 3-4 inches of snow along with the excessive wind and raw conditions caused an impromptu change of plans. As I passed through snowy Franconia Notch I considered mount Martha but was looking forward to a bushwhack. 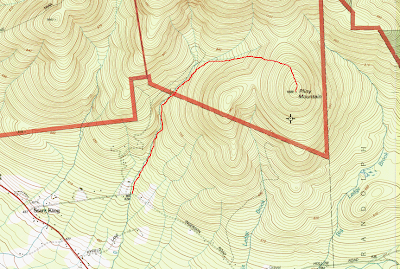 After perusing my DeLorme the nearby Pliny Mountain called my name due to it's short whack, limited views at the summit and a great hill to test my bushwhacking ability and start off the winter hiking season. At 3605 feet it's ranked 87th on the list of New Hampshire 100 highest. I didn't take a lot of photos on this hike for a couple of reasons, the cold temperatures and there weren't a lot of photographic opportunities. Thanks for sharing this! Was especially interested in the current 'state of affairs' along the abandoned Priscilla Brook Trail. Given your assessment, I'd likely just do a bushwhack for the entire distance, should I ever decide to visit Pliny Mountain. By the way, I admire your reporting style. It's concise, and has just the right amount of narrative and photos. 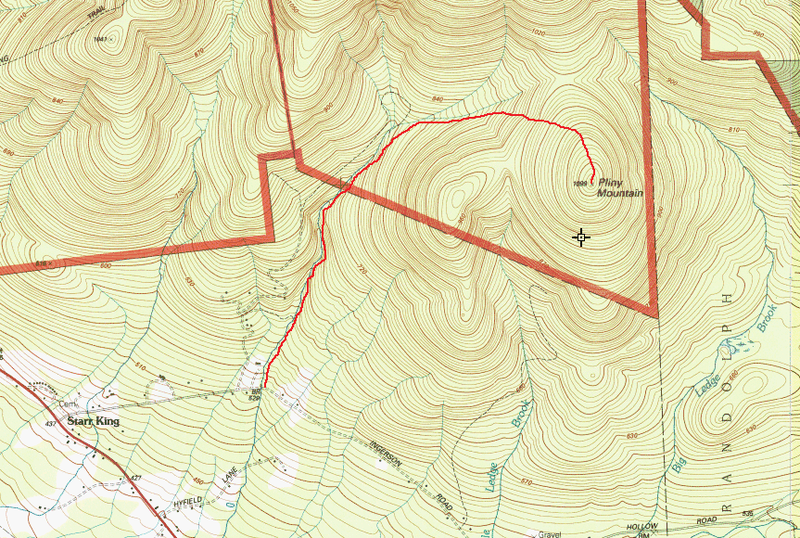 The old Priscilla Brook trail was manageable and probably faster and easier than whacking. The beauty of an ice covered stream reduced some of the monotony. If I were to hike it again I would follow the trail for a mile or so then whack to the southern sub-peak before making my way to the summit. Thanks for your feedback and reading my reports. As a blogger and follower of my trip reports are there any additions or modifications you would like to see? Honestly, I have given it some thought, but cannot come up with anything other than to suggest that you NOT make any changes to your reporting style. I fully appreciate the time it takes to produce a concise narrative, and to choose only a few from the many photos taken during a hike. You do a great job on both counts!